Hippie clothes. Bohemian clothing. Artsy clothing for expressive women! Retro Miss Regular Size One Size classic gypsy hippie chick bohemian shabby chic styles for creative women. Handmade boutique styles at affordable prices. 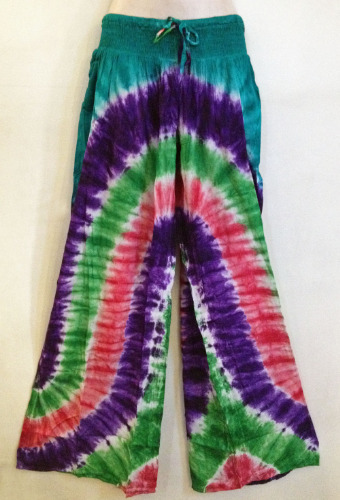 100% LIGHTWEIGHT Rayon Tie Dye gypsy peasant hiphugger palazzo pants. These pants have 3 inches of comfortable elastic smocking at the hip with a drawstring. These pants also have a low rise styling and sit on the hips. Because of the handmade nature of these garments, sizing varies. The measurements here represent an average measure of this garment. Measurements are taken with the garment stretched.